The Key Marco Cat will be showcased at the Marco Island Historical Museum through April 2021. If you’ve been to Marco Island on Florida’s southwest coast, you’ve likely passed images of the city’s mascot on street signs. Now you can see the real thing. The Key Marco Cat, a world-famous statuette made between 500 and 1,500 years ago, is back home for an extended visit. Well before there were bridges, high rises, and tourists, the barrier island just north of the Everglades was inhabited by the Calusa people, from as far back as 500 A.D. A treasure trove of Calusa artifacts was discovered there in 1896 by anthropologist Frank Hamilton Cushing, the most important of which was the carved wooden cat. The feline find, along with other rare Pre-Columbian Native American artifacts unearthed at the same time, recently went on display at the Marco Island Historical Museum and will remain there through April 2021. 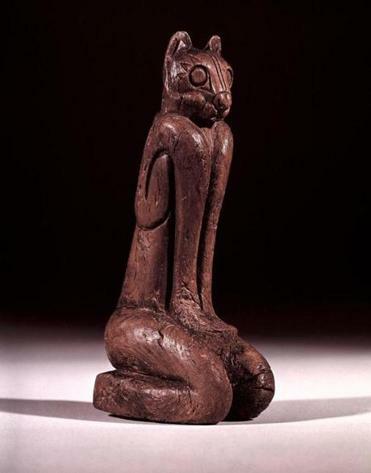 The Key Marco Cat, only 6 inches tall and carved by the Calusa from native hardwood, has been described as one of the finest pieces of Pre-Columbian Native American art ever discovered in North America. Because the Key Marco artifacts, many of which are believed to have had deep ritual significance, were buried in an oxygen-free layer of muck, they are incredibly well preserved. This is the first time in more than 100 years that these items have been together on Marco Island since their discovery. The other artifacts include a ceremonial mask, alligator figurehead, painted human figure, and sea turtle figurehead. All are on loan from the Smithsonian Institution’s National Museum of Natural History and the University of Pennsylvania’s Museum of Archaeology and Anthropology. The loaned artifacts will be featured within one of the museum’s permanent exhibits, “Paradise Found: 6,000 Years of People on Marco Island.” Their arrival was precipitated by enhancements to the exhibit, including interactive activity stations, state-of-the-art projections, dramatic animations, and new original artwork and other additions to the museum’s immersive life-size Calusa Village.